introduction to "the sport of kings"
The Southampton Hunt and Polo Club offers a three phase introduction to 'the sport of kings" that is designed to take a beginner and teach them the rudiments of the game so that he or she understands the game, its rules and can participate in match play competively and safely. Regular Polo, participation in club play. The following is a breakdown of a normal 10-Hour Introductory Program. However, the Pro will adapt it to suit the ability and experience of the individual student. Chukkers: Graduation; actually playing a game with players of comparable experience. Riding sessions will usually be one-on-one but never more than 3 students per instructor. Classroom sessions may be in groups. The ten hours can be scheduled at the convenience of the student and pro. 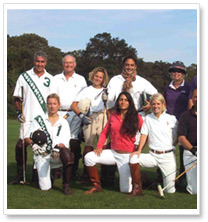 SHPC will provide the instructor, polo pony, tack, groom, mallets and facilities. The student need only bring boots, helmet & gloves. Cost : $2,000. Payable 50% at signup & 50% after the 5th hour. Following completion of the introductory phase the novice can move into the Low-Goal Program. At this point it will be necessary to rent or lease at least one ,but preferably two horses, to participate fully in the program. Your Pro can provide details and costs involved.